No one can write this. The story of a recording never reads like this does. The simultaneous sensations of the music being a great departure from Bowie’s original recordings as well as seeming to be maybe a little diffuse or impersonal endure as “The Man Who Sold The World” takes on a more synthetic vibe thanks to the wash of keyboards which replace the song’s original instrumentation and Charlie Pollack’s pitch perfect but emotionally mute vocal performance, Cristin Milioti’s winsome vocal take on “Changes” (which sounds a lot like Jolie Holland) seems genuinely faraway and haunted and Sophia Caruso’s take on “Life On Mars?” showcases a lifetime of vocal training before Hall returns to nearly collapse under the weight of his own performance of “Heroes,” which closes the disc. Each successive track opens another voice and another layer of the emotional drive which powered it which really helps to build the universality of the music and adds a fantastic new dynamic to it; while the way the music would relate to the dramatic structure of the play would likely re-contextualize it, the music and performances are forced to stand without that background here and so produces the image that the whole world could have a David Bowie song on its lips – it’s pretty cool. Conversely, while it may not have been intentional, the second disc in this collection really feels tacked on – in spite of featuring the final song that David Bowie recorded. At just four songs deep, Disc Two of the Lazarus set looks light before it spins on a CD player – particularly given that one of those four songs can already be found on ? – but it easily captures the imaginations of Bowie fans thanks to the other three. The highlight of Disc Two, of course, is “Killing A Little Time.” At just three minutes and forty-nine seconds long, the song ventures band to Bowie’s more ‘succinct but moody’ period by infusing some awesome nervous energy into what would otherwise be a very introspective affair. Throughout “Killing A Little Time,” Bowie wobbles along sounding both angry and frail, and sounding s though he wants to curse as he foresees the end of love and the end of life, and does it all over an urgent musical arrangement which implies the end of the world. Different instruments collide with each other regularly throughout the song and really add a wracked impression to the track – but the results still hold together as those crashes simply come off like unusual accents. That power easily overshadows both “Lazarus” and “When I Met You” for sheer power and the novelty of being “the final Bowie song” alone, and really just parallels “No Plan,” which neither adds to nor detracts from these proceedings dramatically. Actually, none of the four tracks on Disc Two is poor, they (with the exception of “Lazarus”) simply feel unfinished; Bowie was notorious for writing, re-writing, arranging and then re-arranging songs and then totally re-thinking them completely on a regular basis (just look at the different versions of “’Tis A Pity She Was A Whore” and “Sue” – for example), and seventy-five percent of the songs on Disc Two feel as though they were simply caught in mid-evolution. So how does Lazarus hold together as a set? Realistically, no one’s going to complain about getting a few songs which otherwise fell off the final album by David Bowie, and the cast recording of Lazarus is definitely interesting from a ‘dramatic twist at the end of a career’ standpoint. It’s all great to listen to, and worthwhile – just that the assembly of the set seems strange; these two discs could easily have been separated and would have sold very well as the ‘Cast Recording’ and ‘Black Friday 12” single’, so why lump them together like this? Some fans would say they’re happy that Sony/Columbia chose to release them as a set in the name of economy and the way the set plays isn’t bad really, but that doesn’t mean the two discs wouldn’t play better separately. 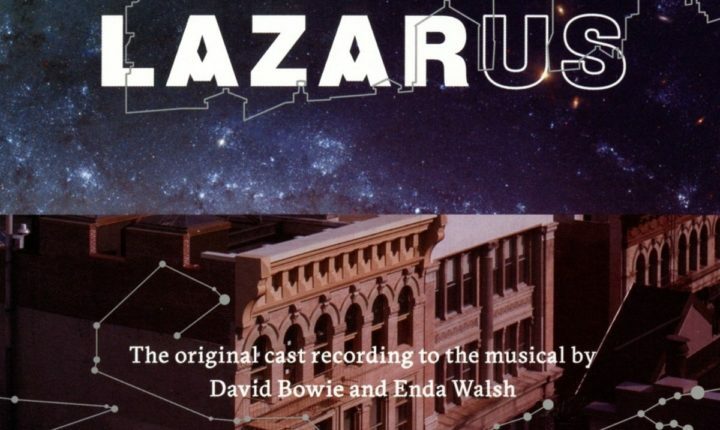 The Lazarus – Original New York Cast (2CD) is out now. Buy it here on Amazon.